We have many other stone jewelry sets not listed in the menu above, such as Garnet, Peridot and Jade. Just click on the "Assorted" link above. If you are not in the United States and wish to place an order, please read this information. If you are interested in creating your own jewelry, I also sell silver beads and findings. Sterling Silver Sponge Coral and Garnet Necklace. See Closeup. 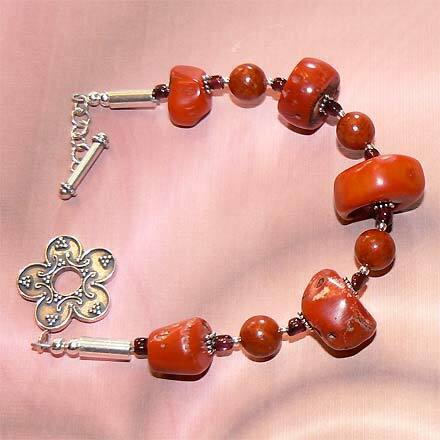 Sterling Silver Sponge Coral and Garnet Bracelet. 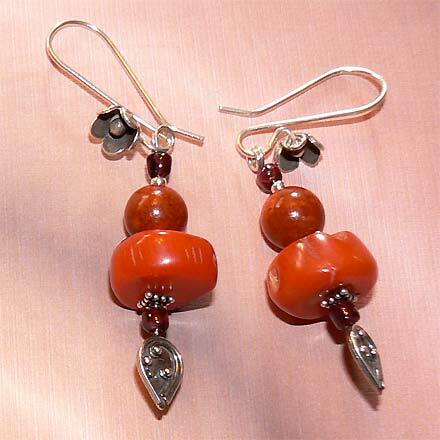 Sterling Silver Sponge Coral and Garnet Earrings. Please read this if you are ordering outside the U.S.
Lovely hues of red barely tinted with orange. The jewelry is composed of both Sponge (round beads) and Branch Corals (large Heishi beads) as well as dark red Garnet which makes such a good complement to the red Coral. 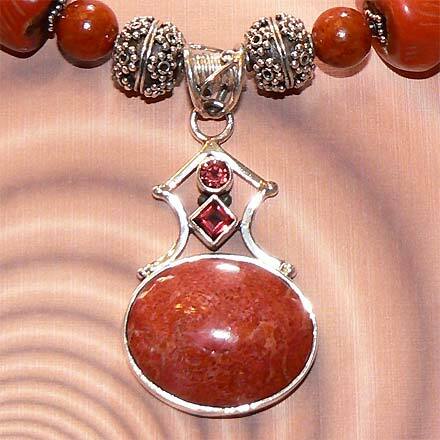 The necklace comes with a Garnet set in the clasp. 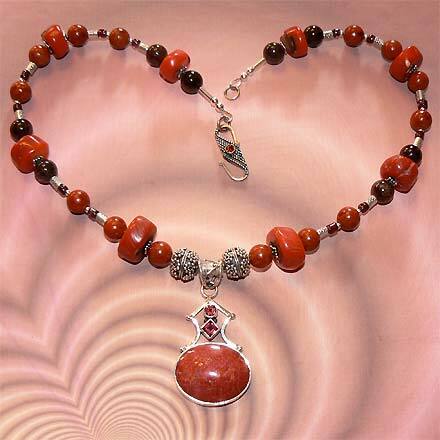 For those who are interested in Astrological significances of stones, Coral is associated with Taurus and Garnet corresponds with Capricorn, Aquarius and the month of January. Please Read: All chains, wire, findings, settings and silver beads are solid .925 sterling silver, NOT silver plated. Size of pendants include setting and bail; size of necklaces and bracelets are approximate and include clasp length. Please note that bracelets tend to be on the small side for smaller wrists as it is easier to add links to adapt to a larger wrist than it is to remove beads to fit a smaller wrist. You can have a local jeweler add links to extend the toggle clasp, however this is not a service that we provide. Please read carefully before ordering! – Please do not adjust the quantity purchased in the shopping cart. All items are one of a kind and the quantity that appears in your cart will already be correct. – The "Add to Cart" (PayPal) feature above is for purchases in the USA only. Please read this if you are ordering outside the U.S.
– To pay by Personal Check, Money Order or Google Checkout, email us at "ann at eyebalm dot com" with with the names/descriptions/URLs of the items you want to buy, and we will email you an invoice. Sales tax of 5.5% will be charged to those living in Wisconsin. All items are unique, one-of-a-kind creations, therefore you can not order more than one of any individual item. Please note that due to differences of color monitors, we cannot guarantee that the jewelry will look exactly the same in person as it does on the screen. We try our hardest to photograph the jewelry and present it on the web to look as much like it does in person, but some monitors have better color accuracy than others. Copyright © 1996-2019 Ann Stretton. All Rights Reserved. No part of this website may be copied or reproduced. Permission is not given under any circumstances to use any of the graphics or art on this site for any purpose whatsoever unless the appropriate license has been purchased.